The cafe can be found off Dereham Road on Longwater lane, there is not much parking space outside though. Order your food at the counter, the blackboard will help you decide which fry up you are after. Sit by the window if you prefer or even outside if you fancy it. The binmen were either camera shy or just very fond of their truck. The coffee was fairly standard but is included in the price of the breakfast. The condiments were all present and correct but could have done with a quick wipe. The big breakfast was indeed nice and big. Under those 2 eggs were 2 whole uncut slices of good fried bread, there goes another few days off my life! Nice sausages, tinned tomatoes and really tasty mushrooms. Things were going well! 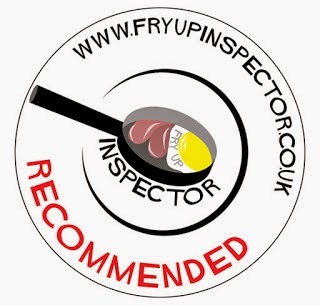 This was the first time I would be leaving a Fry Up Inspector calling card with web address on the back. After having your website recommended I tried this café and was very pleased! The food was great and a nice friendly atmosphere. I’d definitely recommend it to any fry up lovers and I’ll be going again very soon! i went there today the place was filthy staff are rude never again!!!!!!!!!!!!! !